Wow, it's the last Friday in January already?! Where the heck is time going? Seems like just yesteday we were celebrating the New Year. Our last challenge of the month comes from Kim, and she is starting us off with a great sketch, and she also wants us to use something new from our stash. I used the sketch but I'm sad to say that I don't have anything new in my stash! Yep, its true..I bought just about everything in the Holiday Mini back in October and haven't bought anything since. I've got my eye on a bunch of stuff from the Occasions mini but just haven't placed an order yet soooo...no complete mashup for me today. 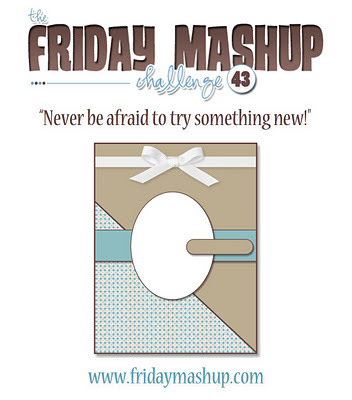 Make sure you head over to The Friday Mashup blog to check out all the great cards from the rest of the design team and make sure you play along with us! The projects we see each week from everyone are just awesome and I know *I* love checking them all out! -Make a project using the "Sketch". -Or "Mash it Up" and create a project "using the Sketch & something NEW in your stash". Hi Lisa, I really love the mix of greens you've used here. 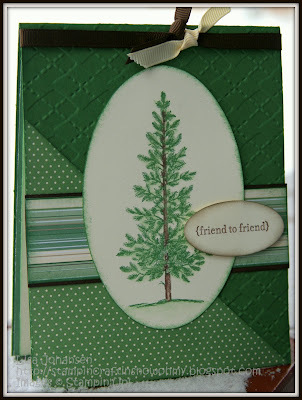 Lovely card, that tree is gorgeous. Who needs new when you have Woodland Walk and Lovely as a Tree? :) Those are two of my absolute favorites. I'm totally hoarding the last of that paper, especially the woodgrain sheets! Great take on the sketch, Lisa! I love this! The contrast of argyle, dots, and stripes with this almost-monchromatic card. This card would be great for a man or a woman. Great job! Now, go buy something new! LOL!! This Lovely as a Tree image works perfectly with this sketch. I checked out the aurora photos - awesome!! I didn't know about your other blog... I'll have to check in more. Love all the greens! Great monochromatic card. Great card, I love the mix of greens you used.